Break Off Relations With Modernist Rome! - Supplique pour l'arrêt des discussions avec la Rome moderniste. - Petizione per la fine delle trattative con la Roma modernista. Break Off Relations With Modernist Rome! To Your Excellencies Bishops Richard Williamson, Bernard Tissier de Mallerais, Alphonso de Galarreta and Bernard Fellay from your humble flocks: We the Undersigned beg of you to oppose any further communication with Modernist Rome and to fight against any internal forces within the Society of Saint Pius X, if such forces exist, that may now or in the future seek to make an agreement with Modernist Rome. We beg you to remember and hold fast to your assurances of the past, claiming that it would be wrong to have anything to do with Modernist Rome until such time as it has returned to the Faith, voided Vatican II and rejected the Novus Ordo. We the undersigned beg Your Excellencies to make your rejection of any further communication or agreement with Rome clear with a public statement. 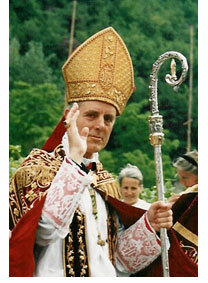 We implore that you maintain and uphold the words of your consecrating Bishop, Archbishop Lefebvre, who in his last years stated repeatedly that there was no further need to communicate with Rome and that nothing short of a complete return to the Faith by Rome would be sufficient for any manner of agreement. We beg that you will forgive our presumption in addressing you in this manner and that you understand that it is only with great fear and urgency that we do so. Supplique pour l'arrêt des discussions avec la Rome moderniste. Aux Excellences, les Evêques Williamson, Tissier de Mallerais, de Galarreta, et Bernard Fellay de la part d'humbles fidèles : nous vous demandons de refuser toute future communication avec la Rome moderniste et de combattre, maintenant et dans le futur, toutes les forces à l'intérieur de la FSSPX qui agiraient pour signer un accord avec la Rome moderniste. Nous vous demandons de vous rappeler vos convictions passées : aucun rapport avec la Rome Moderniste avant qu'Elle n'ait retrouvé la vraie Foi, qu'elle ait abjuré Vatican II et aboli cette infâme parodie qu'est la « messe » de Paul VI. Nous vous demandons de signifier ce refus de toute communication future avec la Rome moderniste par une déclaration officielle. les catholiques de Tradition du monde entier. Petizione per la fine delle trattative con la Roma modernista. Noi vi chiediamo di rifiutare ogni futuro colloquio con la Roma modernista e di combattere, oggi e sempre, tutte le forze, se ve ne sono, all'interno della Fraternità Sacerdotale di San Pio X, che si adoperano per sottoscrivere un accordo con la Roma modernista. 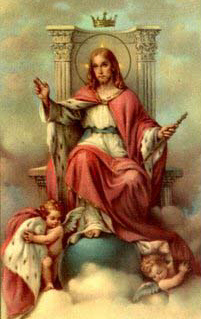 Noi vi chiediamo di ricordarvi delle vostre convinzioni passate in merito al fatto che non è conveniente avere nessun rapporto con la Roma modernista fintanto che essa non abbia ritrovato la vera Fede, fintanto che essa non abbia abiurato il concilio Vaticano II ed abolito quella infame parodia che è la "messa" di Paolo VI. Noi vi chiediamo di proclamare pubblicamente questa rottura delle trattative con Roma. Preghiamo il Dio degli Eserciti affinché voi manteniate fermamente la linea tracciata dal vostro vescovo consacratore, Mons. Lefebvre, che, nei suoi ultimi anni, ha spesso ripetuto che non vi è alcuna necessità di ulteriori comunicazioni con Roma e che niente potrà giustificare alcun futuro "accordo" se essa non tornerà a professare tutta la vera Fede. Noi vi chiediamo di scusarci se abbiamo ardito interpellarvi in questo modo, e vi preghiamo di comprendere che questo accade soltanto a causa della preoccupazione e dell'urgente desiderio di chiarezza che ci hanno imposto di agire così. I cattolici fedeli alla Tradizione del mondo intero. Abbruch der Relationen mit modernistischer Rom! Bernard Fellay von Euren demütigen Herde. Kommunikation mit modernistischen Rom und zu Kampf gegen jede interne Kraft im Priesterbruderschaft St. Pius X, wenn es solche Kräfte tatsächlich gibt, welche nun oder in die Zukunft versuchen Verständnisse mit mordernistischen Rom zu machen. Wir beten Euch zu erinnern und an Festhalten an Eure Versicherungen von gestern, idem wir meinen dass es fehl wäre etwas mit modernistischen Rom zu tun zu haben bevor die Zeit wenn es an die Glaube wiederkert habe, anulliert Vatican II und die Novus Ordo kaltgestellt habe. Wir die Undergezeichneten beten Eure Excellenzen Eure um Zuruckweisung jede weitere Kommunikation oder Verständnis mit Rom klar zu machen durch eine öffentliche Erklärung. Wir beten Euch die Worte des konsekrierenden Bischof, Erzbischof Lefebvre zu halten, wer während seinen letzten Jahre wiederholte dass es kein weiteres Anlass mit Rom zu kommunizieren gab und dass nichts weniger als eine vollständige Rückkehr zum Glauben genug wäre für jeweilige Einverständnis. Wir beten dass Sie unsere Überheblichkeit in Zuwendung dieser Weise vergeben und dass Sie verstehen werden dass es nur mit grosse Besorgnis und Betroffenheit dass wir es so tun. Die traditionellen Katholiken der Welt. Bp. Richard Williamson speaks the truth about modernist Rome on 19-11-2006 a. D. in Poland.